Brachial Plexopathy is a condition that occurs when there is damage to the nerves that exit the cervical spine. This injury can be caused by stretching of the nerves, trauma, tumor invasion or radiation injury. Patients with brachial plexopathy have numerous neurological symptoms which include pain in the shoulder and arm, numbness, tingling and weakness in the shoulder and arm. Movement of the shoulder and arm may worsen the symptoms. Examination of the shoulder and arm may reveal loss of sensation or abnormal response to sensory testing. There may be motor weakness of the shoulder, arm or hand. 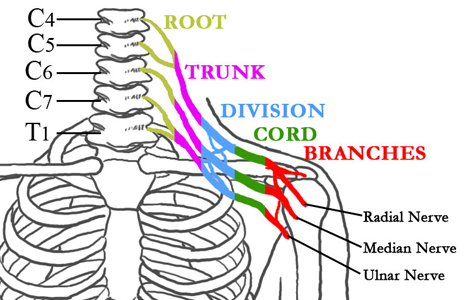 Frozen shoulder and thoracic outlet syndrome may be confused with brachial plexopathy. MRI scans may be useful to determine the cause of the problem. Nerve conduction studies may also point to the origin of the pain. Laboratory studies are needed to look for inflammatory causes of the pain. Treatment of brachial plexopathy involves physical therapy to retain as much strength and mobility as possible. Anticonvulsants such as Gabapentin, Pregabalin and Carbamazepine can help to control the pain. In severe cases, destruction of the brachial plexus by radiofrequency lesioning or DREZ lesioning may be helpful.